How often do you talk to someone you don’t know? I mean really talk. How often do you sit down and find out what makes them tick; their heartbreaks, habits, humanity? How often in the daily routine of waking up, consuming breakfast, going to work, coming home, decompressing and sleeping do you talk to someone you’ve never met before? This, dear reader, is one of my favourite things. I’m not saying that I patiently listen to every odd ball for hours on end nodding in sage, referential priestliness. God no. I’m the first one to bend another’s ear, to introduce myself, to fill an awkward silence, to chew the fat. Social butterfly is the fitting term, dear reader. But I also like to listen. Lean in. It’s when listening that you become a better person. That sounds like a pretty big call doesn’t it? Listening to others makes you a better person? Big. Call. But I think that listening is the contribution. The ‘being’ in human being. The other day, I was about a third of the way through my every day routine. I had spoken to my neighbours, colleagues, students. No one new. An overwhelming feeling overcame me. I want to talk to someone new. The best place to do this in close proximity to my parked car that day was a local wine bar. Wine bars have bartenders. Bartenders like to talk. I wanted to talk. You can see the genius of my conclusions here. I tottered down to the cute little bar stocked with a vertical wall of wine and grabbed a stool. I introduced myself to the cloth-draped bar-tender and then looked at the time. It was four p.m.
Gosh, is wine even served at four? Turns out it is. It wasn’t very long until my friendly bartender, let’s call him Greg, started talking. He anxiously began about his work, his baby, his accidental night conceiving said baby. You can see that it didn’t take long for Greg to open up. Actually I think he opened up at the exact moment that I decided to listen. It works that way. This listening thing. The writer in me observed detail. I noticed the way he jittered and tapped on the counter with what I assumed were caffeine-fuelled fingertips. I saw the darkness under his eyes and the way they lit like river-lanterns when he spoke of his young son. He talked of things that I knew nothing of; the after-work life of a bartender, the politics of hospitality, the difficulty of shift work with an infant whom he craved time with. I started to understand him in some small way. Listening has such a powerful way of connecting us. And yet it’s so simple its genius. I remember listening to an elderly woman in a Vietnamese field tell me about the day her husband was shot down in front of her. I remember a stripper in the dressing room of a Las Vegas Club tell me why she removed her clothes for money. I remember sitting on a decadent carpet talking to a Turkish man about how his first love died at fifteen and he felt that he had never been able to love again. Closer to home, I remember listening to a workmate whom I had NEVER had a conversation with before in a compulsory ‘get to know you session’ that often accompanies the beginning of a work year, tell me that her greatest regret in life was having children. In every single one of these conversations I became a better person. I contributed by listening. I’m not saying that every conversation has to be you sitting there just listening. That’s not conversation. And without your side, the chat doesn’t snake and flow, trust isn’t built and the bridge isn’t crossed. It’s important for you to be listened to too. As a writer though, listening is the greatest gift. So find yourself a bar, a stool and a bartender and swap places. Not literally, of course, that would involve you not enjoying wine, but spiritually swap places. Become the listener and hold back on the need to respond. Just. Listen. You might just find that the person unloading to you is not the only one better for it. 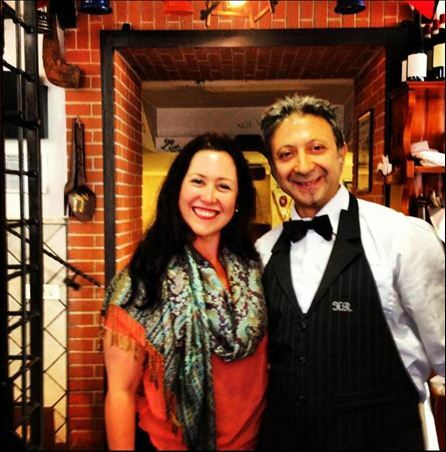 A wonderful Italian waiter whom I met in Rome. I waited out a fierce afternoon storm getting to know him and his country’s delicious food.